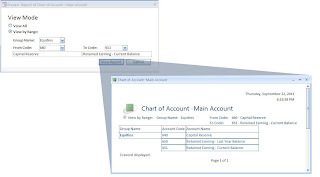 In previous posts, you already know how to create simple reports using the Report Button provided in the Reports Group. This posting will modify the report that was created to be displayed according to our settings like in the picture below. The picture above shows that when clicking the Preview command button, MS Access will display a dialog box that contains instructions to be executed. 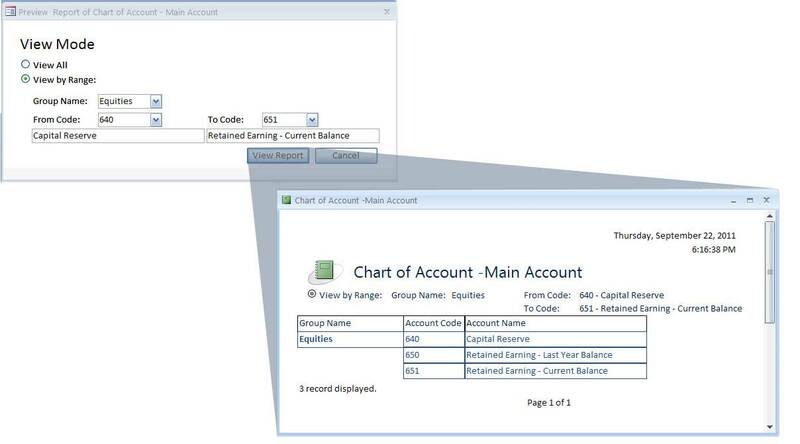 MS Access will then display the report in accordance with that instructions. For example, see below picture. When we choose report to be viewed by range, then related combo box controls will be on, and we are being asked to enter the given values in that combo boxes. After clicking View Report button, MS Access will display a report based on that given values. 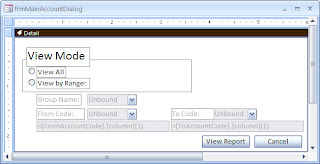 Creating such above report involve a wide range of MS Access objects: table, query, form, report, and module. To make such a report, follow these long steps. Set View All as the default. Click next to continue. Set Value for View All is 1 and View By Range: is 2. Click next to continue. Caption = View Mode and click Finish. Drag field GroupName on to the form. "Either From Code or To Code is empty", vbExclamation, "Empty Field"
Finally, go to Form properties and set the Record Source to blank. Save form as frmMainAccountDialog and close it. Open form frmMainAccount as in the picture below in design view. Save and close frmMainAccount. The form is ready for used.